St Peter is at the heart of the Saints, and what a bleak heart it can be on a winter's day! Narrow lanes thread across flat fields; whichever way you cycle seems to be into the wind. In summer, the sky is wide over the hedgless barley fields, but the road drops away beyond the church to cross a bridge over a stream. Here you find most of the parish's seven houses, because in terms of population this is one of the smallest parishes in East Anglia. This is a pretty little church, mainly of the 13th and 14th centuries. On previous visits I had to go and get the key, but today, like all the churches in this big friendly benefice, St Peter is kept open. This is just as it should be, for any church in such a tiny parish needs to be there for more than the Sunday club. St Peter fulfills its role as a welcoming home to strangers and pilgrims admirably. In the porch there is what appears to be a brick-lined charity dole table. As with several of the Saints, you step through a Norman south doorway into a Victorianised, rural interior. The Tasburghs have left slight marks here; one tomb is hidden by the organ, and this must have been the Lady Chapel in those days, because that was where he asked to be buried. There are cusped image niches either side of the chancel arch, and the late medieval font has a Jacobean cover. The loss of the two young men named on the war memorial must have made a considerable impact on such a tiny parish. 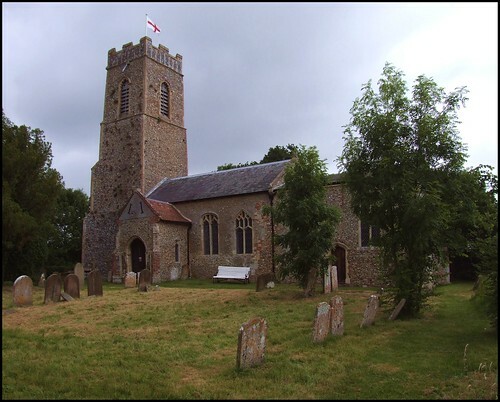 Other than the churches, there are only two buildings of note in the South Elmhams, and one of them is St Peter's Hall, on the road from this church to South Elmham St Margaret. It is a large 16th century building, the origins of which are uncertain. It was the home of the Tasburghs, and was probably built by them. But it looks ecclesiastical, and there are devotional symbols in the window masonry. However, there was never a Priory or an Abbey here. The great windows and other stone may have come from Flixton priory, three miles away, after the dissolution. Some may even have come from the now-vanished church of St Nicholas. The Tasburghs are gone now, and, after many years as a farmhouse, the building has a new lease of life as St Peter's brewery and restaurant. Back in 2000, when I had last come this way, I stood taking a photograph of it. Out of the corner of my eye I saw a stoat leapt the gap from the adjacent field and scutter across the road in front of me. I looked, and it turned, bared its teeth, and then disappeared into the furrows. What a brave little fellow! I still think of it often.